Mastering the audit of a service management system (SMS) based on ISO 31000, in compliance with the requirements of ISO 19011 and ISO 17021. This five-day intensive course enables participants to develop the necessary expertise and knowledge to support an organization in implementing and managing Risk as specified in ISO 31000. Participants will also gain a thorough understanding of best practices used to appropriately Risk Management across all the principles of ISO 31000. This training is also fully compatible with IEC/ISO 31010 which supports ISO 31000 by providing guidance for risk assessment. 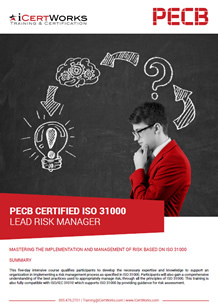 Contact us about ISO 31000 Lead Risk Manager Training!